I've baked dozens of artisan bread for the last couple of years. Yeaterday I came accross a problem I haven't seen before. The dough, the same dough I am working with over and over got glued to the stone. I had different thoughts of what could be the cause of that. First, I used some water around the stone for steaming something I did not do lately. I think some of the water dripped on the stone. I was sure it's nothing as the oven was on 450F for 20 minutes before the dough went in. Is it ok? Is that the cause. Second, I use to wait at leat 15m after the over gets to the final 450F temperture before bringing in the dough. This time I brought it in without the extra 15m. Could that be the cause? You ideas are greatly appreciated. Difficult to say, exactly, but cold stone = sticking loaf every time. I'm not clear on what you mean by "water around the stone" but don't put water directly on your stone, hot or cold. What you describe is a stone that has not had time to heat up to the desired temperature. It takes a full hour for most stones to get near the oven temperature. If you get an infra red meter you can see for your self. If you don't mind having your oven on for that time, your patience will be rewarded with a well baked bottom crust. Or, you could remove the stone and bake on a sheet pan with parchment paper as soon as the oven ready beeper goes off. I will test it this evening! As I'm always baking with a stone - what exactly is "sheet pan with parchment paper"? This is a 18 x 13" sheet pan. Typical size of a "sheet pan" for home use. Also sometimes referred to as a "half sheet" pan, as opposed to a "full sheet" pan, which is about twice as wide. Full sheet pans are too large for many home ovens and are mostly used by professionals. The paper lining the pan is parchment paper and is similar to wax paper, only much better and more costly(but reuseable). It prevents baked goods from sticking to pans(or stones). Sorry to ask again - can you send a link to place where I can by this? IS it good for 450F? Thank you. 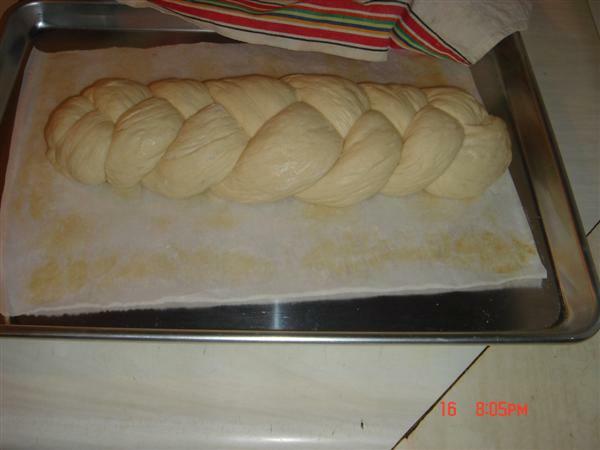 Actually it is just a braided loaf of Italian bread(kingarthur.com). I am located in America(USA). Parchment paper can be purchased at most grocery stores here. It is usually located near the wax paper, aluminum foil, etc. Most parchment paper is good for use at least up to about 450F. The pan was purchased a Walmart. Most larger discount and department stores here sell a good selection of bakeware. If you cannot find these items at your local stores, or if you are not located in America, the only sources I can suggest are Amazon.com or Ebay.com(for your locale).